A-1 Rental and Supply is a family owned rental equipment and sales store right here in Green Country. We have been selling and servicing Stihl and Gravely equipment for over 34 years for folks in and around the Tulsa, OK area. We are proud to have helped 100s of homeowners rent equipment for housework, as well as, assist them in the purchase of their first lawn mower. We have two locations. We are located at 102 W Morrow Rd. 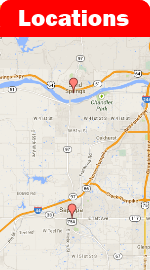 Sand Springs, OK 74063 and 919 S Main St. Sapulpa, OK 74066. Stop by to say hello and check out our supply of rental equipment and equipment for sale. At A-1 Rental and Supply we have the ability to service the equipment you buy from us in addition to your existing equipment. Customer satisfaction is so important to us that is why our owners office in store and are available to answer any questions. We invite you to connect with us on Facebook. You can always have confidence that you will be taken care of at A-1 Rental and Supply. If you aren’t looking for rental equipment you should know that we have a full showroom of new and used Gravely and Stihl equipment for sale. We have the best rental equipment pricing in Sand Springs, OK, Sapulpa, OK and Tulsa, OK. But don’t take our word for it come see for yourself. You will find zero turn, utility vehicles, excavators, tillers, seeders, cutters, weed eaters, hedge trimmers, Bob Cats and so much more at our stores. We are A-1 Rental & Supply, your number one equipment rental & supply source in the Tulsa area. What began as a family-owned business in 1977 has evolved into a multi-location dealer. Our years of experience in the rental industry make for a store with a friendly environment, and timely ordering which means a fuller stock for all of your landscaping needs. Whether you're looking for a dependable chain saw, trimmer or blower, you'll find it at a good value at A-1. We're dedicated to bringing you quality equipment and service with a smile. Visit us and tell your friends!